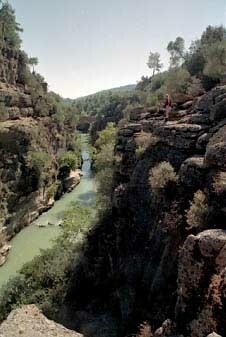 Somewhere between Antalya and Alanya you find the Köprülü Canyon, a national park. 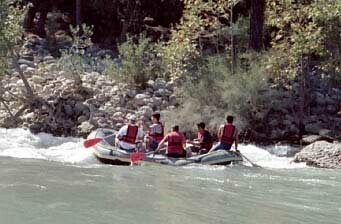 It is a mountainous area, with several rivers. 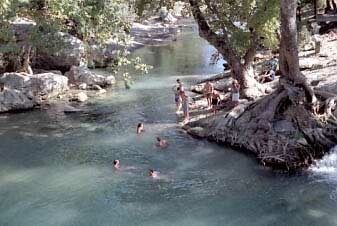 As we think of Turkey as a warm and dry country, this really surprised us. We went here to walk. 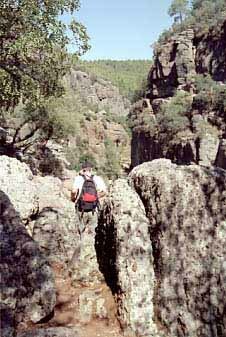 But the path was sometimes very hard to find, and we had to climb over rocks to find it. As the temperature wasn't too good for walking either (over 30 degrees), after an hour or so we decided to go back and have a drink and lunch in the village. On returning, we met some other people who walked on light sandals. We are probably wimps, complaining over the bad track with our big hiking boots. Out guide book promised us only little facilities: one restaurant and not much else. 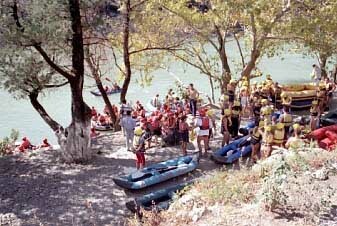 This book is several years old: nowadays the Köprülü Canyon is very popular for rafting. Busses filled with people come here from all the hotel areas between Antalya and Alanya. They are provided with hats and rescue vests, get some instructions and go of for a restaurant some kilometres downstream. There they get lunch, and then have a visit of a carpet factory or of a shop with leather clothes or jewellery. The better (and more expensive) tours fill the rest of the time with some swimming, instead of scheduled stops at places where you can buy things you don't want.